Beer 900. I don’t know if I’m impressed with my effort or depressed at the investment made, but it was mostly in happiness and enjoyment so I’ll not dwell. But I do have a bit of a beer to get me there. 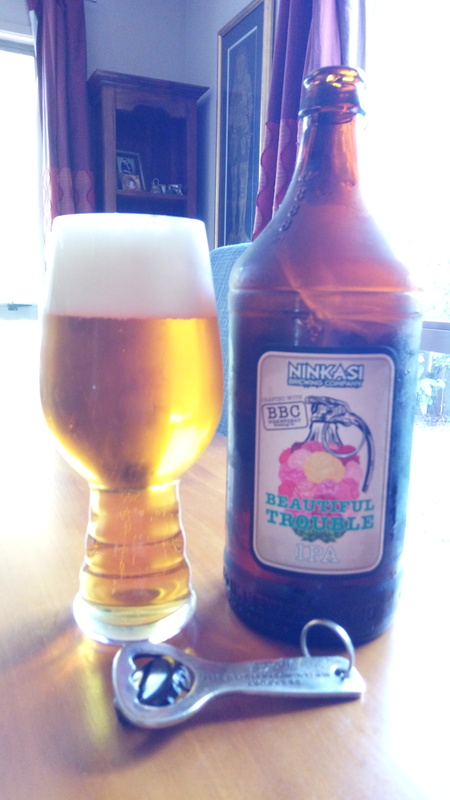 Ninkasi & BBC Beautiful Trouble. A beer the brewer mentioned was coming. An effort to find, a quick seller the lovely lady in the shop told me, and then she let slip that the keg version is coming too, and to keep an eye out. An eye out I will, as I did for this. Strange but compelling 888ml bottle size of beer, 7% ABV, making it 210 calories a serve, this also has 65 IBU things, and 4.9 standard drink units. Beautiful Trouble IPA is a big American IPA with a touch of Kiwi inspiration. It has a citrusy hop aroma with a big hop flavour balanced on a rich UK Ale, Munich and Vienna malts. Ninkasi’s portfolio of beers has been dominated by IPA’s since they began brewing 10 years ago in the USA. The BBC was transfixed upon learning that they shared similar life values. They both sensed beautiful trouble brewing. With the combination of NZ and US hops, and creative inspiration from two hemispheres, this beer will delight with its hop forward nature, balance and poise. Great things happen when Americans and Kiwis get together for beer. unmissable green grass hoppy aroma on opening, which I’m happy to drink in for a bit before I pour. Bright golden pour with generous white head of reasonable noise when you listen. Aroma is a thud of damp grass which also seem oily. Taste is of a bitterness that is pleasing and lipsmaking, oily green hop taste washes over everything and you get a dry tap at the back of this. I like bitter beers, but this one is quite singular in where that is, a sharp peak, that leaves and ends up in the lingering mouthfeel. I personally don’t really enjoy that oily resin aroma, and I personally really enjoy it’s taste, so that’s a balance, perhaps I should skip the pre sup sniff? I like too how this calms down a bit as you get used to what’s coming and it fills out, often you start liking a beer a lot to run through the whole thing then question yourself as it tails aways and you curb your enthusiasm. I’ve drunk a few of those beers. Different though this is a beer that you start by being impressed with that hop and oil bitterness and then more impressed with the way that the support and underlying tastes pop up to get noticed. That’s properly good beering is that. The pdubyah-o-meter rates this as 9 of its things from the thing. This is a very generous beer, plenty of hop notes, grassiness, sharpness, and lots of bitterness too, and then there’s the second act of the citrus and oil notes that chime in to round it out. The bitterness for me was a really steep peck instead of a gentle and persistent climb. But my word this is another above average and decent beer from the local chaps, even if they thought they needed help..
Where did I get it? FWDC in Constellation, the last bottle of their delivery. luck for me. Would I share with a friend on a porch and set the world to rights? This is a killer IPA and it’s going to rock the boat about what you can and can’t do with hop combinations. A brilliant beer to challenge to current top of pile IPA beers. ractures Born out of studio experimentation, Fractures is the moniker of Mark Zito. 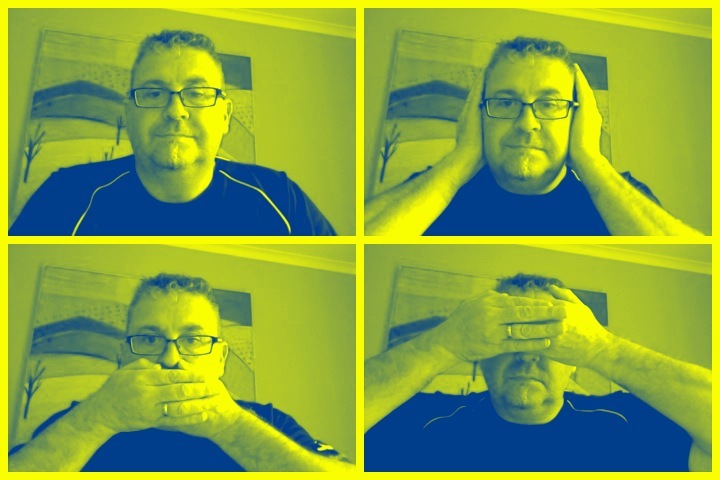 Fascinated by different genres, Fractures explores the different and disparate…. (and we’ll leave that there). 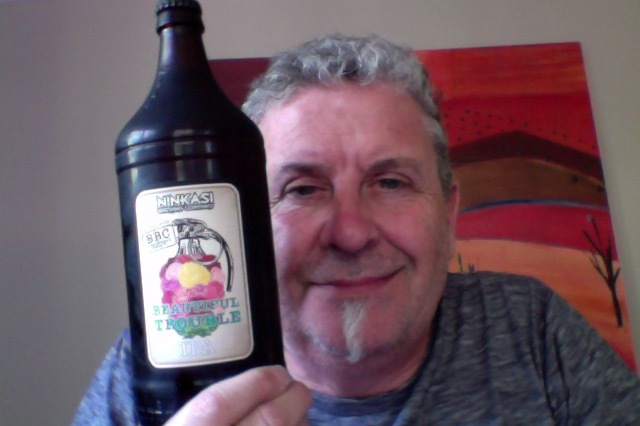 This entry was posted on February 11, 2017 by Philip Walter in BBC, Beer, Beer of New Zealand, Beer Review, Craft Beer, Critic, India Pale Ale (IPA), Justsaying and tagged Auckland, Birkenhead beer, collaboration beer, craft beer, IPA, Ninkasi & BBC Beautiful Trouble.